In the product setup you can specify a second and third tier price. See item number 16 in Product Setup to see where to specify second and third tier prices. When a cashier does a price change and there is only one price, the manual price change screen will appear. If there is a second and/or third price tier, then a screen will appear allowing the cashier to choose another price tier or do a manual price change. You can also use price tiers with price modes. In the POS module click on the 'Price Mode' button. You can choose to apply the price mode to the current sale only. Note that only items added after the mode was selected will use the selected price tier. The price mode will go back to the normal price mode after the current sale is completed. 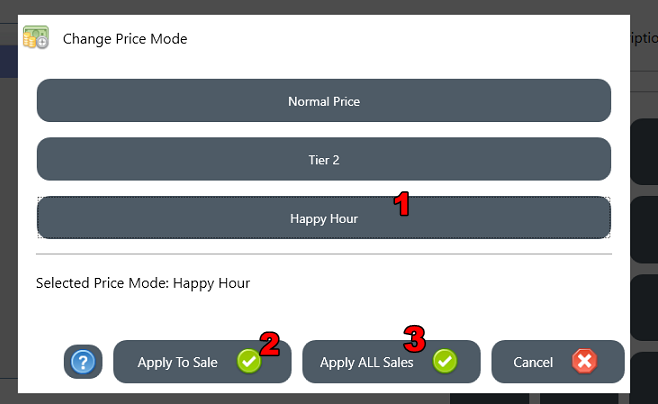 You can choose to apply the price mode to all sales. The price mode will stay on this mode until the user logs off, the program is restarted or another price mode is selected. The current price mode will be displayed on top of the POS module (where the user, drawer and other info is displayed). 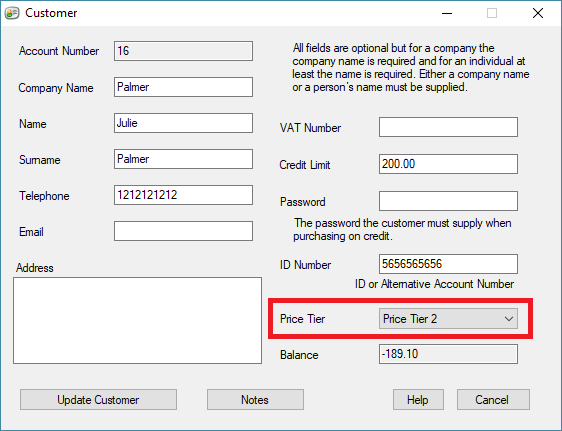 An example where the 'current sale' option would be used is if you allow a specific customer to purchase all the products at the second or third tier prices. Note another option for changing prices for a sale is to use discounts. 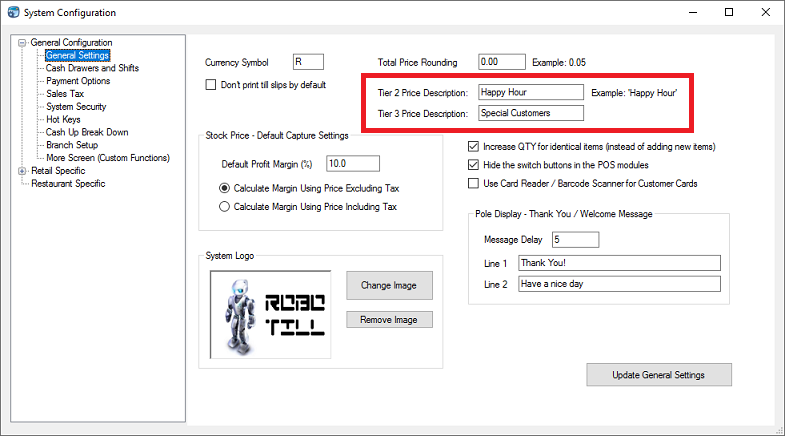 An example for 'until restart' is for something like 'Happy Hour' where you sell all your goods to all customers at another tier price for a specified time. 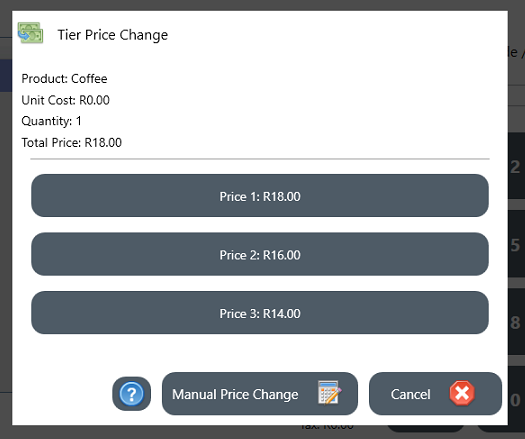 You can change the Tier Price labels as they are displayed in the POS application so that they are more descriptive to the cashier. To change the descriptions, open Manager and go to Setup > System Configuration > General Configuration > General Settings. You can allocate a specific price tier level to a specific customer. If the customer card is scanned/swiped during a sale, then the price mode for that sale will automatically change to the price tier allocated to that customer. To allocate a price tier to a customer edit the customer in ROBOTILL Manager > Customers > Customers.